In The Netherlands, on the occasion of the celebration of the Queen’s birthday, a number of citizens are appointed to knighthood by her Majesty the Queen as a result of their valuable contributions to society, science, art, or sports. 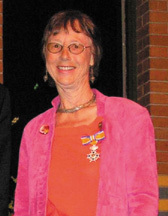 On 29 April 2005, one of these royal awards—Knight of the Order of Orange Nassau—went to Dr. Lida Schoen for her numerous efforts to promote education in and public understanding of chemistry, not only in The Netherlands but also globally. The Order of Orange-Nassau is conferred on people who have rendered outstanding service to the community for a considerable period, often people who carry out voluntary work for all manner of civil society organizations. Lida Schoen after receiving her royal medal, engraved with the motto “JE MAINTAINDRAI.” Congratulations to Dr. Schoen, who proudly wore her YAC badge for the occasion! Before receiving honors in her homeland, Schoen was busy being an ambassador for chemistry. On 16–17 April 2005, she participated in the 5th Arab Conference on Teaching and Learning where she presented the Young Ambassador of Chemistry (YAC) project, outlining its aim of enhancing the public understanding of chemistry with the help of young students. One of the recommendations to emerge from the event was to hold an interactive discussion with teachers at the 6th Arab conference next year to discuss their ideas for organizing YAC events in Egypt. Then, less than a month later, Schoen went to Argentina, where she helped organize a YAC event from 9-15 May. The event was held at and hosted by ESSARP, the English Speaking Scholastic Association of the River Plate <www.essarp.org.ar>, which is located in the heart of Buenos Aires. Lida Schoen graduated with a degree in chemistry from the University of Amsterdam. She worked as a teacher trainer and during the last 10 years as an educational consultant, mainly for international projects. She is a team member of and trainer for the Science Across the World program and is a titular member of IUPAC’s Committee on Chemistry Education. Her main interest is in communication and public understanding of science. Curious about YAC? See the link below.